If you have given up deep-fried, pre-cooked and packaged meals to follow a healthy lifestyle, chances are that you feel hungry more often than earlier because your diet includes high protein and high fibre content. Hence, increasing the number of your meals and not skipping them, especially breakfast, is a good idea. Night time is the longest your body stays without food, so you need this energy in the morning to start on a high. However, we've heard about the term 'busy mornings' that doesn't allow fancy breakfasts. 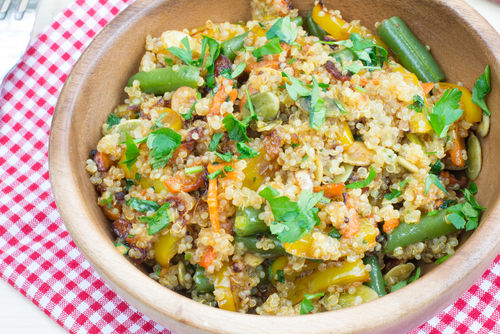 So for the little time you have before you leave for work, here are a few healthy, tasty and easy quinoa and oats recipes that you won't have to hire a cook for! To serve one you will need: 1/2 cup quinoa, 1 orange (cut in segments), 1/2 red bell pepper (dice it), 1/2 jalapeno (dice it), 1/2 cup boiled black beans, 1/4 cup corn kernels, 1/2 red onion (chop it), 1 teaspoon of chopped cilantro leaves. For orange vinaigrette: 3 spoon olive oil, 3 spoon apple cider vinegar, 3 spoons of freshly squeezed orange juice, orange zest (keep the quantity as per your liking), 1 tablespoon honey. Now you need to: Take a cup of water in a medium saucepan and cook quinoa as per the packet instructions. Meanwhile, prepare vinaigrette by whisking olive oil, apple cider vinegar, orange juice and zest and honey together and keep it aside. 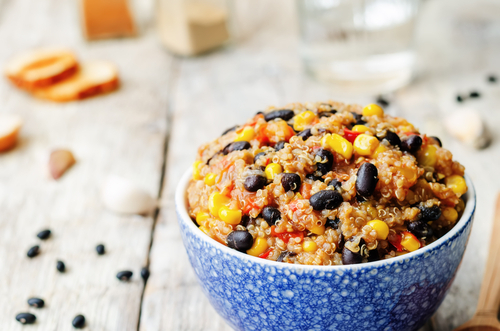 Once quinoa is cooked, mix it well with the orange, red bell pepper, jalapeno, boiled black beans, corn kernels, red onion and cilantro leaves. Pour vinaigrette on the top and toss them gently. Your healthy salad is ready! To serve one you will need: 1/2 cup oats, black salt (to taste), 1 green chili (dice it finely), 1 clove of garlic (finely chopped), 1/2 carrot (dice it), 1/2 red onion (dice it), 1/2 potato (dice it), 1/2 tomato (dice it), 1/4 cup peas, 1/4 cup diced beans, 1 teaspoon Maggi masala, 1 teaspoon chopped coriander. Now you need to: Add a half cup of water in a saucepan, add black salt, green chili, garlic, carrot, red onion, potato, tomato, peas and beans. Cover the pan until the vegetables are boiled. Uncover and add 3/4 cups of water and oats to the pan. Let the oats be soaked. Keep stirring. Once the water is completely absorbed, sprinkle Maggi masala on it and mix it well. Eat it while its warm. To serve one you will need: 1/2 cup quinoa, 1/4 cup shredded red cabbage, 1/4 cup red bell pepper (dice it), 1/4 cup corn kernels, 1/4 cup grated carrot, 1/2 avocado (chop it), 1 green onion (slice it finely), 1/4 cup noodles. For sesame vinaigrette: 5 tablespoons rice wine vinegar, 1 clove of garlic (chopped and pressed), 1 tablespoon sesame oil, 1 tablespoon honey, 1 tablespoon grated ginger and 1 tablespoon soy sauce. Now you need to: Whisk rice wine vinegar, garlic, sesame oil, honey, ginger and soy sauce together and keep it aside. In one saucepan pour water and cook quinoa; in the other pan, boil noodles. Once done, mix quinoa, noodles, red bell pepper, red cabbage, corn kernels, carrot, avocado and onion together. Evenly spread sesame vinaigrette on the mix and gently toss it. 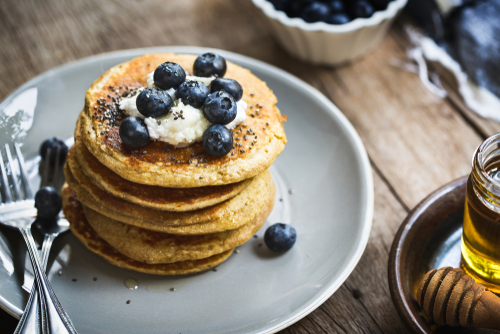 To serve one you will need: 1 cup of ground oats, 1/2 cup of semolina, 1 tablespoon curd, 1/4 teaspoon salt, 1/4 teaspoon vanilla extract, 1/4 teaspoon cinnamon, 1/2 teaspoon olive oil, 3 teaspoon honey, one ripe banana (mash it), 1/4 cup blueberries, 5-6 sliced almonds, a pinch of baking soda. Now you need to: Mix ground oats, semolina, salt, curd, baking soda in one bowl (keep the consistency between medium to thick, add one spoon of milk, if needed) and whisk banana, honey, vanilla extract and cinnamon in another. Leave the batter for a few minutes while you get ready for work, then mix the two together. Heat a nonstick pan, spread some olive oil on it and pour two scoops of batter at a time. Leave that side of the pancake on the lower side of the pan until it's fully cooked from there. Once it turns brown and solid, flip it. Repeat it with other pieces. Serve it on a plate and top it with blueberries, almonds and honey. Viola! 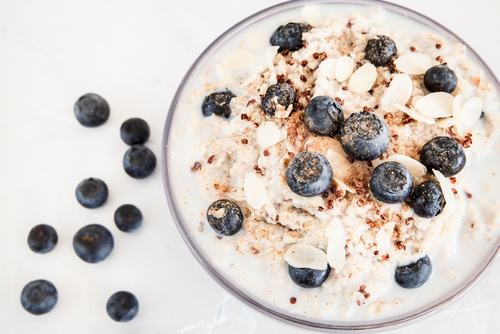 To serve one you will need: 1 cup of milk, 1/4 teaspoon of grounded cinnamon, 1/4 teaspoon vanilla extract, 1 cup of cooked quinoa, 1/2 cup blueberries, 6-8 sliced almonds, 1 tablespoon honey. Now you need to: In a cup, mix milk, cinnamon and vanilla extract. 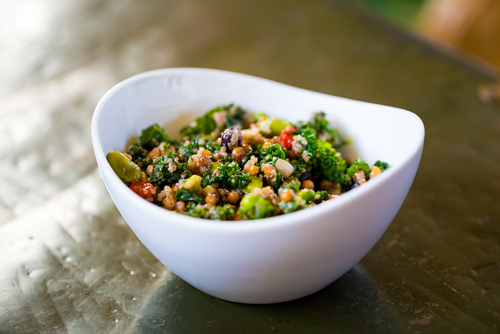 Spread the cooked quinoa evenly in the serving bowl. Pour the mixture of milk on it and then top it with blueberries and almonds. Drizzle the honey on the top and savour your yummy breakfast. To serve one you will need: 1 cup of grounded oats, 1/2 cup of chickpea flour (besan), 1 tablespoon curd, 1/2 teaspoon salt, 1 green chili (dice it finely), 1 teaspoon of olive oil, 1/2 finely chopped onion, 1/4 teaspoon of crushed cumin seeds, a pinch of baking soda. Now you need to: Whisk grounded oats, chickpea flour, curd, baking soda, salt, green chili, cumin seeds and onion thoroughly. Keep the consistency medium (add more curd if needed). Leave the batter for a few minutes while you get ready for work. Heat the pan, spread a teaspoon of olive oil on it and then pour two scoops of batter on the pan. Leave that side of cheela on the lower side of the pan until it's fully cooked from there. Once it turns brown and solid, flip it. Repeat it with other pieces. Serve it on a plate and eat it with a dip or ketchup! To serve one you will need: 1 cup chopped kale, 1/4 avocado (dice it), 1/4 cup cooked quinoa, 1/4 cup pomegranate arils, 1/4 cup chopped pecan nuts, 1/4 cup crumbled goat cheese. For lemon vinaigrette: 3 teaspoons olive oil, 3 teaspoons apple cider vinegar, 2 teaspoons freshly squeezed lemon juice, zest of 1/2 lemon, 1 tablespoon honey. Now you need to: Whisk olive oil, apple cider vinegar, lemon juice, lemon zest and honey together to make the lemon vinaigrette. In a bigger bowl, mix well kale, avocado, cooked quinoa pomegranate arils, pecan nuts and goat cheese. Pour the vinaigrette on the mixture and toss it gently. It's ready! To serve one you will need: 1 cup cooked quinoa, 3 teaspoons balsamic vinegar, zest of 1/2 lime, 1/2 mango (dice it), 1/2 red bell pepper, 1/4 cup chopped red onion, 3 teaspoons of unsweetened coconut flakes, 5-6 sliced almonds, 2 teaspoons of raisins, 1 teaspoon of chopped cilantro leaves. Now you need to: Mix balsamic vinegar and lime zest. 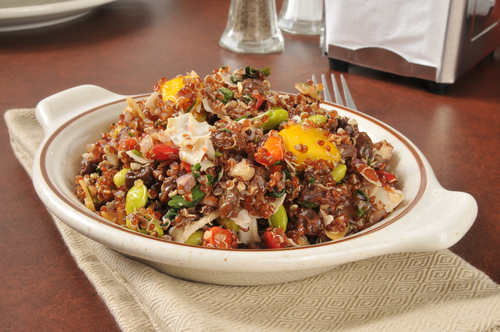 In a large bowl, mix together quinoa, mango, red bell pepper, red onion and cilantro leaves. Top it with coconut flakes, almonds and raisins. Pour balsamic vinegar and lime zest mixture on the top and toss it gently before consuming. Off you go now, you have a lot of breakfast options, try them!